According to a new report North America Smart Labels Market (2017-2023), published by KBV Research, the North America Smart Labels Market is expected to register a CAGR of 17.8% during the forecast period (2017-2023). 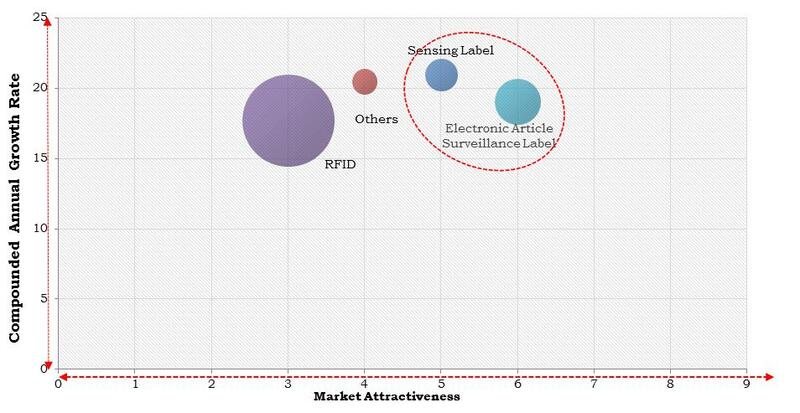 The RFID market dominated the North America Smart Labels Market by Product Type in 2016, and would continue to be a dominant market till 2023, growing at a CAGR of 17.1 % during the forecast period. The Electronic Article Surveillance Label market is expected to witness a CAGR of 18.4% during (2017 - 2023). Additionally, The Sensing Label market is expected to witness a CAGR of 20.3% during (2017 - 2023). The US market dominated the North America Perishable Goods Smart Labels Market by Country in 2016, and would continue to be a dominant market till 2023; growing at a CAGR of 17.9 % during the forecast period. The Canada market is expected to witness a CAGR of 20.5% during (2017 - 2023). The Logistics market dominated the Mexico Smart Labels Market by End User in 2016, and would continue to be a dominant market till 2023; growing at a CAGR of 17.1 % during the forecast period. The FMCG market is expected to witness a CAGR of 19.8% during (2017 - 2023). The Healthcare & Manufacturing market would attain a market value of $33.9 million by 2023. Additionally, The Automotive market is expected to witness highest CAGR of 21% during (2017 - 2023). The report has exhaustive quantitative insights providing a clear picture of the market potential in various segments across the countries in the region. The key influencing factors of the North America Smart Labels Market have been discussed in the report along with the elaborated company profiles of Advantech U.S. Inc., Alien Technology Inc., Avery Dennison Corporation, CCL Industries Ltd., Graphic Label Inc., Invengo Information Technology Co Ltd., Muehlbauer Holding Ag & Co., Thinfilm Electronics, Sato Holdings, and Zebra Technologies Corporation.